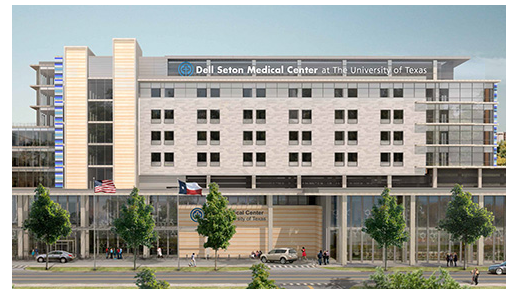 ​​AUSTIN – The Dell Seton Medical Center at The University of Texas is on track to move in patients from University Medical Center Brackenridge on May 21, 2017. The hospital, with 211 beds and 13 operating rooms, is built on property owned by UT, leased to Central Health and subleased to Seton. The partners believe the facility's technological capabilities and the fact that it will be a training ground for medical students and researchers at The University of Texas Dell Medical School could bring revolutionary changes to health care, said Greg Hartman, Seton's vice president of external affairs. Seton is covering the $310 million development cost, which includes $260 million from Ascension, the health provider's parent organization. The remaining $50 million is coming from donors.